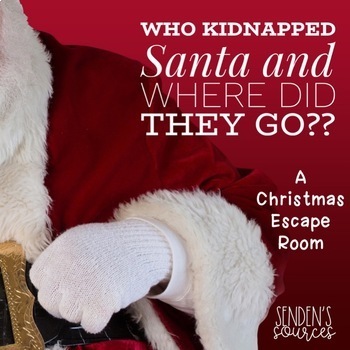 Can your students solve the mystery of who kidnapped Santa and where did they go? 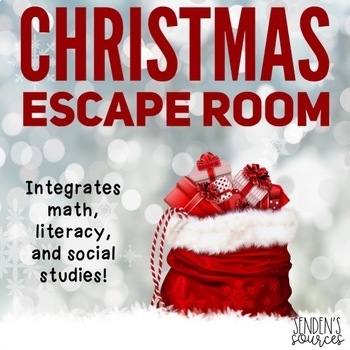 There are 2 versions of this escape room so it works with multiple grades. Each version also comes in black and white too! There are either multiplication and division problems or addition and subtraction problems. Also, this escape room focuses on parts of speech too. It includes a part of speech poster that you can display to help your students solve the puzzles. This escape room covers social studies standards about American symbols and educates students on history with an interactive slideshow! Scatter clues around the room. I hide my clues well and it takes about an hour to complete. Next hand out student record forms. Your students will cross off names of people they discover around the room, solve math problems, and the parts of speech questions, and record all information on the handout. You will hide name cards, grammar pictures, math problems, and the letters that correspond with the math problems around the room. The answer to each math problem equals a letter clue. On the student handout forms they will cross off all the names of people that they find. There will be one name that they do not find. On the grammar posters they will find only one of that word. For example, on the pronoun poster there is only one pronoun. Students will write all grammar words on the student handout. I display page 6 on the smart board for students to use to help them complete the grammar portion. Then students will record all math problems and find which letter goes with each math answer. For example, 2 x 3 = 6. The letter cards say 6 = E. So the answer for 6 is E.
Once students have found one name not crossed off, completed all the grammar words, and math problems, you can give them the last page where they will put it all together. They will write the name still listed, the grammar words in the correct spot, and the letter that goes with each math problem that they solved. So when it says 6 they will write the letter E. Then they will be able to finish the room. The answer is Levi Morton and the tiny one eyed monster. They are hiding in the Statue of Liberty. This is a great activity for unity among your students during this holiday season! It is also a great way to review standards!